Sawyer has returned from his vacation on the farm. He was so tired he slept all afternoon. I guess the farm wasn’t all that relaxing. All that running around, chasing dogs, doing whatever else they do there. Maybe he even had chores. Herding sheep? Yeah, that would last for about 30 seconds. 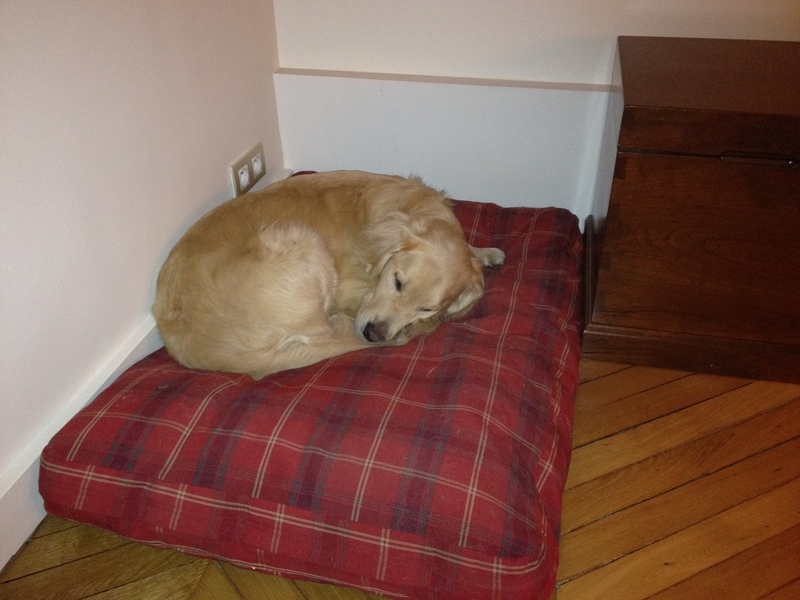 Goldens are not known for their stamina. We always pass Le Notre, a small building housing a cafe (said to be very good, but as yet untested by moi) and a cooking school. 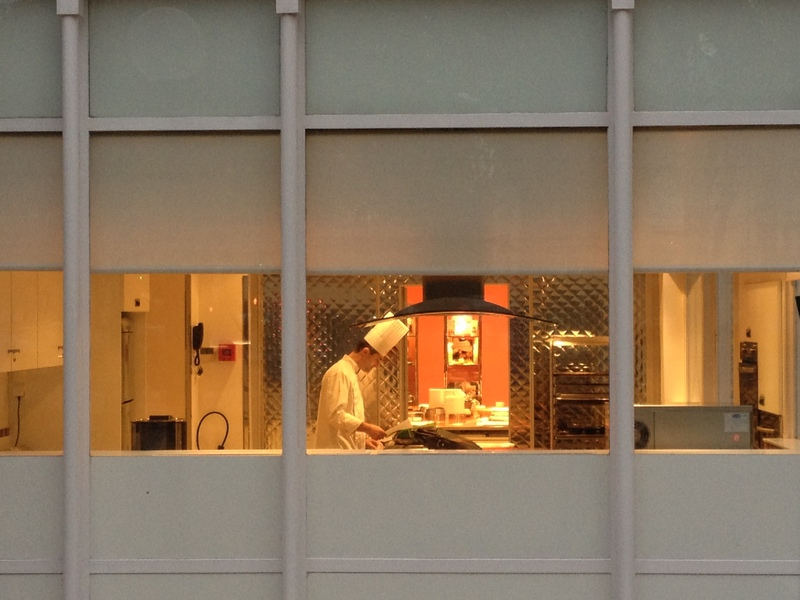 The cooking school kitchen looks out onto the street, and when all lit up in the early morning shadows, it is beautiful. This morning I finally stopped and took a picture of it. It didn’t come out that great (it was with my phone and shot through a window) but you get the idea. I love the pumpkin-colored wall in back, and all the gleaming stainless. 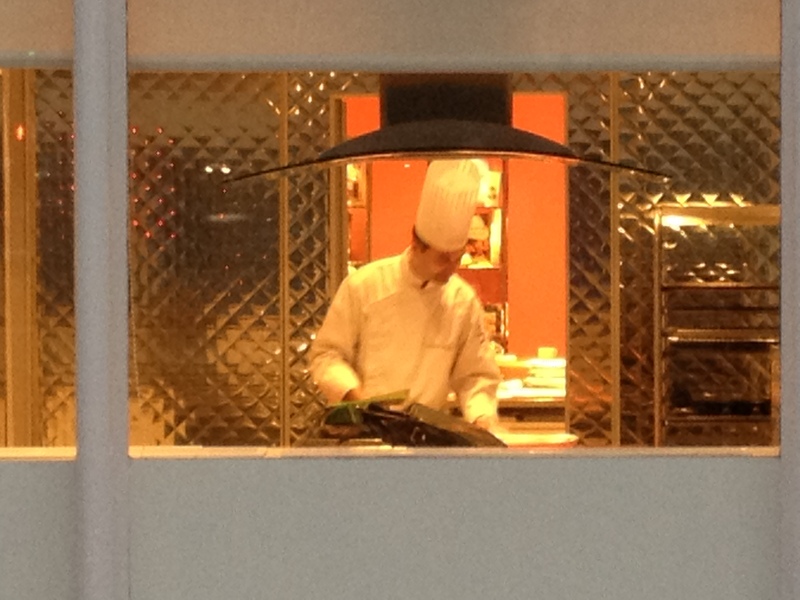 The chef decided to pop in the shot, just as I was taking it, which made it even better. Those two large silver doors slide all the way open, giving a better view of the space. Maybe next time. Morning walks are much better for me than coffee and the newspaper. Have you picked out all your favorites from your kids Halloween candy yet? Save the Mounds for me! You can have my Mounds if I get your Almond Joys – you can share half and still have a whole! We ll I kept the Butterfingers that I was hoarding towards the end of the trick or treating. Keith was very nice this year with the children tho we think we saw his old mask on someone on 6th Street in Austin on Friday night and imagine!! no one seemed scared or even fased!!! Get you Mounds for Christmas. Mark for dinner tomorrow! We love it. So enjoy your blogs.